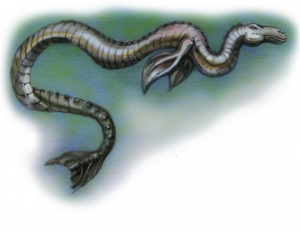 Lake Okanagan in British Columbia, Canada is the home of an elongated swimming cryptid that has been known since the time of the Syilx-speaking Okanagan Indians who called it N’ha-a-itk. The maximum depth in Okanagan is 761 feet and the lake is over 84 miles long. Many people have reported seeing the strange creature, known as Ogopogo. Its thick humps (often several in a row) are observed protruding out of the water. Only occasionally have the head or tail been observed. 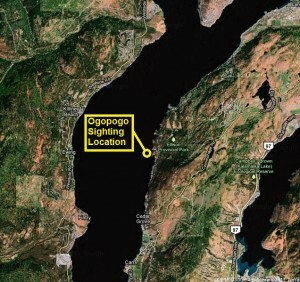 Since some of the recorded sightings involve the humps of the creature coming fully out of the water (like a hoop), it would seem like Ogopogo is something like a sea serpent creature. 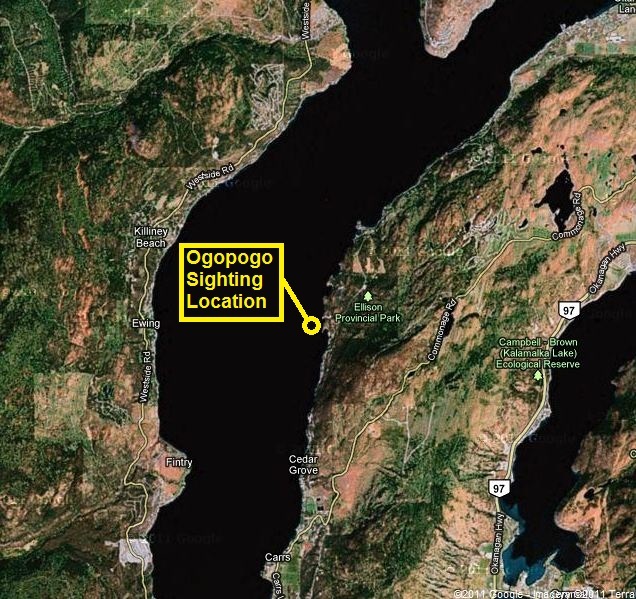 Learn more about the reclusive cryptid on the Ogopogo Page. 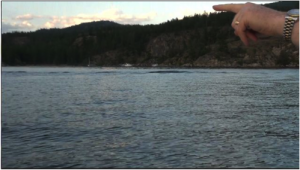 In July of 2011 we determined to personally visit Lake Okanagan, interview Arlene Gaal (the unofficial Ogopogo “Keeper of the Records”) in Kelowna, British Columbia and do some Ogopogo hunting. The Woetzel family was joined by Bill Gibbons and his family. 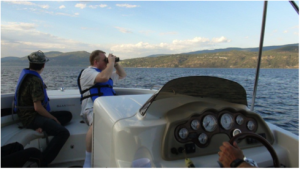 We rented a boat on July 2nd at the Lake Okanagan Resort Marina and headed north/northeast. The water was slightly choppy at first, but about 8:00 PM we rounded a point and the water became quite calm. Suddenly we noticed a disturbance in the water just 30-40 feet ahead of us. We immediately cut the engine. Multiple humps (certainly three but perhaps four) were clearly seen protruding slightly out of the water. They were slightly darker than the surrounding water. These bumps began moving straight away from us at high speed and submerging, leaving a substantial wake. The wake was about 2 feet high as it swept rapidly towards shore. There were no other boats moving in that area at the time and nothing protruded from the water (like a rock or log). No subsequent waves were seen, even though we circled around the area for some time. Our group did notice some small fry jumping out of the water. Perhaps the little fish were being chased under the surface. The whole sighting only took about 20-30 seconds. By the time we grabbed our high-definition video camera, powered it up and started recording, only the final wake was to be seen. The depth finder was registering over a hundred feet and the coordinates on the sighting are N50 d. 10.534” – W119d. 27.097”. Despite days of follow-up work, both on the lake and traveling along the shore, no other observations were made. After having been monster hunting at Lake Champlain, Loch Ness, Lake Memphremagog, Lake Nahuel-Haupi, the Great Lakes, and the Salish Sea (home of Cadborosaurus) this is the first swimming cryptid sighting by the Genesis Park team.